You must provide correct details at the time of making your order on. If you enter an incorrect address, Little Lola Boutique is not obliged to re-send the order to the correct address at our own expense. 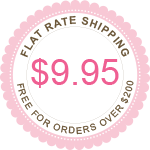 Please email us straight away at hello@littlelolaboutique.com.au if you notice that your details are wrong. If your order has been dispatched LLB is not held liable. All prices quoted on the website are in Australian Dollars (AUD) and include GST. We have the right changes the prices displayed on the website without notice to you. LLB uses paypal or bank deposit to accept payment, you can choose which option you prefer on check out. Products posted from Little Lola Boutique will be posted with Australia Post or Fastway Couriers, depending on your location. Please allow 5-7 business days for delivery. Orders are usually shipped within 24-48 hours of receiving cleared funds for your order. If you have any questions as always please do not hesitate to contact us at hello@littlelolaboutique.com.au or use the contact us form on the website.